Editor’s Morning Note: Freemium is great. And expensive. Remember freemium? Give away the product, and then charge for upgrades or full plans? It was the rage in the early days of the SaaS era1, helping a host of services scale quickly. The low distribution costs brought by pervasive broadband penetration, and diving compute expense via the cloud revolution were a potent mix. If you can give something nearly free away for free, and use it to drive paid usage of your service that is also cheap to maintain, then heck, it’s on. Unless, of course, freemium isn’t as amazing as we thought. We’ll have to pick an example, of course, to understand the point. We’ll use cloud storage, as it has a host of private and public players, and potential margin expansion thanks to Mr. Moore and his magical law. So what does it cost to offer free cloud storage? I’m going to tell you. But first, some history. In late October 2014, Microsoft took a stab at other cloud storage providers by ripping the caps off of OneDrive. The joke, however, was on me. Microsoft mostly took it back on December 11, 2015. All this is to say that even among the largest, wealthiest players in the technology space, the cost of free users is something that has to be at least considered, if not curtailed or flattened. For smaller players, it’s even harder. How long did Dropbox not generate positive cashflow? A very, very long time. 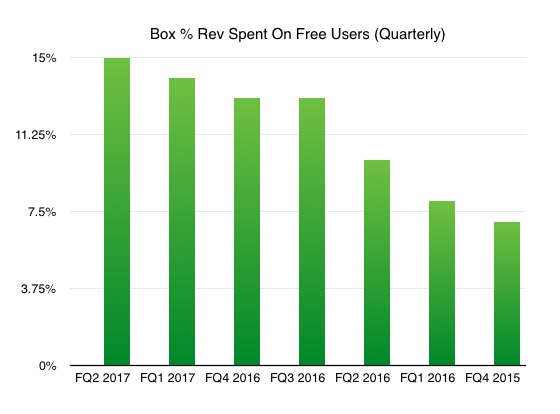 Egnyte dodged the freemium cost altogether, and Box’s work on enterprise customers was a contra-freemium move. 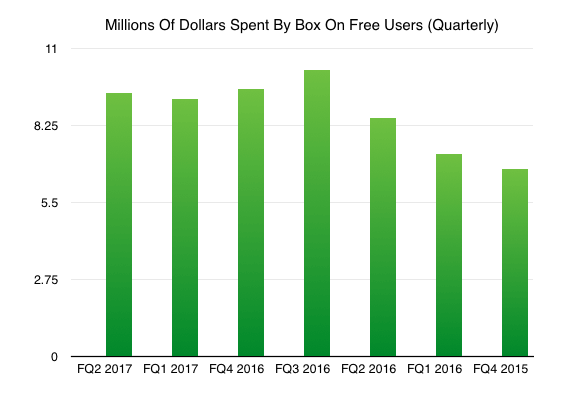 With Box, however, we can actually chart the impact—cost—of its free users since the impact is material to the public company. Caveat IPO, etc. Let’s get to the charts. Box has promised investors that it will soon reach cashflow breakeven. The feat will come as the company still grows at a healthy clip. Therefore, Box is about to make the Great Trasnsformation. Box didn’t have to spend that much cash on its operations compared to its revenue, and most definitely compared to its year-ago quarter. If you are keeping score, those are good things . And that, kids, is the cost of past freemium users that you can’t really slough off without a rack of bad PR and whining, even after your business model has completely evolved into an enterprise play. Freemium is great. And expensive. I’m speaking loosely. Don’t get all temporally specific.